Antique Gold Ring Designs, Custom Made Antique Style Jewelry. Antique Gold Rings And Infact All Antique Jewelry Would Include Heavy Metal Weight, The Gemstones Would Also Be Quite Large. This Was How Jewellery Was Meant To Be In The Years Gone By. 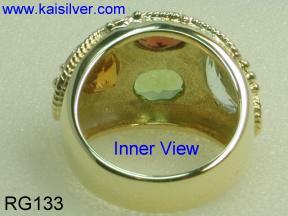 Hundreds Of Years Later Kaisilver Takes You Back In Time By Creating One Of The Wonders Of Antique Gold Ring Designs. This Gold Ring Has A Very Healthy Gold Weight. The Design Is Very Antique And Our Craftsmen Ensure That Every Small Detail Is Attended To. The Gems Are Custom Cut By Skilled Gemstone Cutters. This Antique Ring Design Can Be Made In White Gold Or Yellow Gold And Could Even Be Ordered As A Custom Made Sterling Silver Antique Ring. Gemstones Of Your Choice Can Be Selected. We Provide Total Customization For All Your Jewelry And Gemstone Needs. You Can Even Send In Images Of Your Favourite Designs For Us To Custom Make. 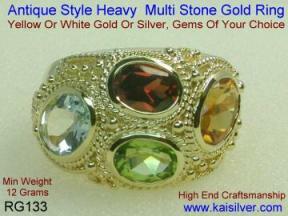 Kaisilver Is The World's Largest Provider Of Online High End Custom Jewelry. Through Our Massive Network That Covers Virtually All Leading Gemstones And Jewelry Producers In Thailand We Have Access To The Largest Base Of Skilled Craftsmen And Gemstone Inventory. All Our Jewellry Is High End Craftsmanship And Each Piece Is Handfinished To Perfection By Skilled Craftsmen. Pricing And Other Details For This Custom Antique Gold Ring Design. Click Here For Pricing Details Of This Custom Antique Style Gold Ring. 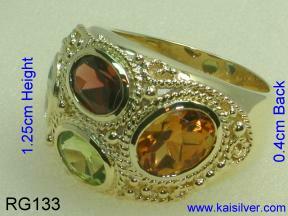 Antique Rings Designs Custom Made, With Gemstones Of Your Choice. This Is Perhaps One Of The Best Rendition Of An Antique Gold Ring Design. Skilled Craftsmen Perform The Intricate Handfinishing And Custom Cut Gemstones Provide The Classic Touch. The Mounting Ensures That Light Passes Through The Gems And Brings Out The Clarity And Glitter Of The Gems. A Very Healthy Gold Or Silver Weight Ensures That Your Custom Antique Ring Stays In Shape For A Long Time To Come. 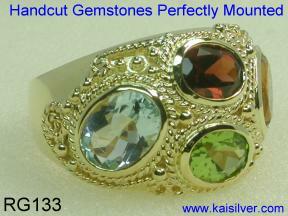 Also Each Gemstone Is Bordered With Gold Or Sterling Silver To Protect The Gemstones. If You Need Any Other Changes To This Custom Antique Gold Ring Style Or Need Something Totally Different Do Not Hesitate To Email Us At sales@kaisilver.com Provide Us The Details And Images If Possible And We Will Be Glad To Work With You On The Final Specifications And Price Quote. Understand What Makes This Custom Antique Gold Ring Design A True Winner. Click Here For More Details On The Making Of This Custom Antique Gold Ring Design.